Oklahoma Connection | Pickens was born in Holdenville, Oklahoma. The autobiography of T. Boone Pickens was published in the 1980s and was listed on the New York Times Bestseller List for several years. In 2001, he published Boone Pickens: The Luckiest Guy in the World. 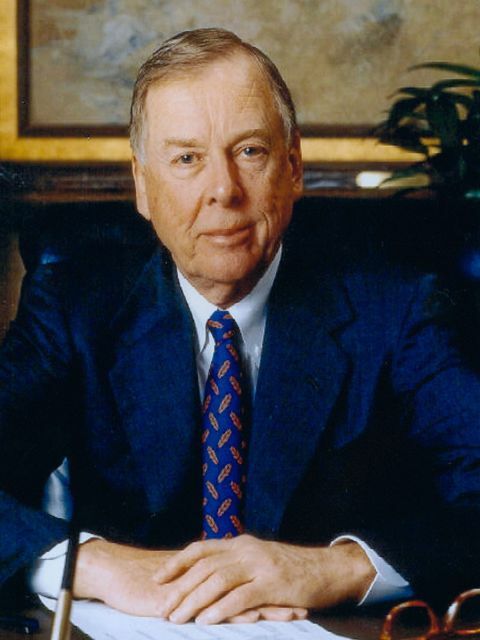 T. Boone Pickens is one of the nation’s most successful businessmen, first building one of the nation’s largest independent oil companies, Mesa Petroleum, and later reinventing himself in his 70s as one of the most successful investment fund operators with BP Capital. In July 2008, Boone launched the Pickens Plan (www.PickensPlan.com), a $100 million grass-roots campaign aimed at reducing this country’s crippling addiction to OPEC oil. His 2008 book, The First Billion is the Hardest, detailed what America must do to win back its energy independence. He closed his energy hedge funds in late 2017 and moved toward a more family business structure, but remains involved in his charitable foundation and advocating for entrepreneurship and shareholder rights. Pickens’ roots in the oil and gas industry are deep. His father was a Landsman in Oklahoma and Texas. Boone earned his geology degree in 1951 from Oklahoma A&M (now Oklahoma State University). Upon graduation, Boone worked for Phillips Petroleum for three years before striking out on his own in 1954. With $2,500 of borrowed money, Pickens and two investors formed an oil and gas firm called Petroleum Exploration Inc., which focused on domestic oil and gas opportunities. Later, he formed Altair Oil & Gas Co. to pursue oil and gas exploration opportunities in western Canada. Both were predecessor companies to Mesa Petroleum, which he took public in 1964. Pickens is a member of the All-American Wildcatters Association, an organization that recognizes industry members of good character, respected by peers, and possessing inherent integrity. (Its motto is, “My word is my bond.”) A number of organizations have recognized Pickens’s accomplishments, including: in 2017, Forbes magazine named him one of the 100 “Greatest Living Business Minds” to mark its 100th anniversary; the 2014 Oklahoma Geological Foundation Legends Award; the 2010 “Effecting Change Award” from 100 Women in Hedge Funds; the 2009 American Security Council’s Lifetime Achievement Award in Public Service; 2009 Time magazine “100” list of world’s most influential people; 2009 L. Austin Weeks Memorial Medal; 43rd annual Texas Legislative Conference “Texan of the Year” award; 2009 Franklin Institute’s Bower Award for Business Leadership; Trader Monthly’s 2006 Trader of the Year award; U.S. Department of Energy, Clean Cities National Partner award, ENRG (2002); Financial World “CEO of the Decade” (1989); Financial World CEO of the Year (1978). He also served on the U.S. Department of the Interior’s National Petroleum Council for 10 years in the 1970s. Pickens also has served on numerous boards and industry associations, including The Dwight D. National Eisenhower Memorial Advisory Committee (2016); Texas Lieutenant Gov. Dan Patrick’s Energy/Oil & Gas Advisory Board (2015); the U.S. Energy Security Council (2012); and the advisory committee of the College Football Assistance Fund (2011). CNBC dubbed him “Oracle of Oil” for his uncanny knack of predicting oil price movements. At a time in life when many businessmen are concentrating on the golf course and ship cruises, he remained a dynamic force in his industry, as evidenced by his fellow Dallas chief executives selecting him as DCEO magazine’s 2013 CEO of the Year. His many professional honors include membership in the Horatio Alger Association of Distinguished Americans, the Texas Business Hall of Fame, and the Oklahoma Hall of Fame. In 1998, the Oil & Gas Investor listed him as one of the “100 Most Influential People of the Petroleum Century.” During the span of his career, Pickens has given away more than $1 billion to philanthropic causes. He is among the most generous university benefactors of all time, having contributed more than $500 million to his alma mater, Oklahoma State University, divided evenly between academics and athletics. See pictures of T. Boone Pickens and other media HERE.